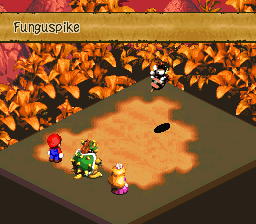 The Funguspike is an attack used in the game Super Mario RPG: The Legend of the Seven Stars. This attack does average damage, but turns the affected target into the form of a Mushroom, leaving them motionless. However, when a party member is turned into a Mushroom, they slowly regain HP each turn. The Mushroom ailment can be canceled while wearing a Trueform Pin or the Safety Badge. However, the target still takes damage from the spike. Kinokobari Mushroom Needle (from ｢きのこ｣ kinoko, "mushroom", and ｢針｣ hari, "needle" (as it has been compounded, the initial "h" consonant becomes voiced). This page was last edited on August 8, 2017, at 18:11.